An enjoyable part of our recent summer walks has included the abundance of fresh blackberries we have been able to find and pick. Foraging around and eating as many of the sweet berries as we want straight off the bush and then filling our small buckets to the top has been quite fun. 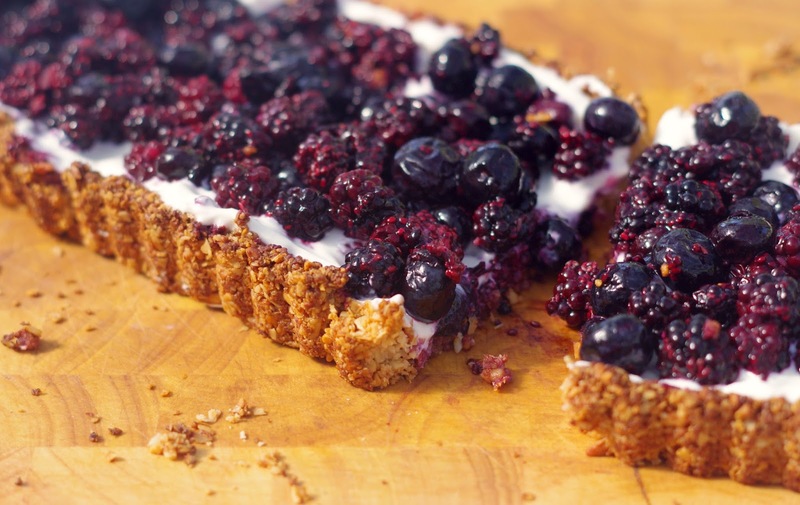 Having said that, you can use any combination of berries, fresh or frozen in this tart. I've used Greek yogurt for the filling, just because it is my favourite and I was keeping this sugar free. But you could easily use your preferred flavoured yogurt or mascarpone or even a slightly sweetened cream cheese to create an equally appealing creamy element. You can use any shaped loose bottom tin, in fact I was initially going to make these into individual small tarts using muffin tins but that just seemed like a bit too much work in the end! It comes together very easily and you feel like you are indulging in a proper dessert minus the guilt! I just wish my photos did it justice, I'll have to re-shoot the photos with better light when I make it next time, and there will be a next time! Pre-heat oven to 180 degrees Celsius. Blend almonds in food processor until they resemble course crumbs. Add rolled oats, oat bran and salt and pulse to combine. Add coconut oil, rice malt syrup and almond essence and pulse until the mixture comes together. Press mixture into greased loose bottom tart pan. Bake in oven for 15 minutes or until golden. Remove from oven and allow to cool. Meanwhile add berries, 1 tbsp rice malt syrup and chia seeds in small saucepan. heat until berries just start to break down and release some of their juices. Set aside to cool. 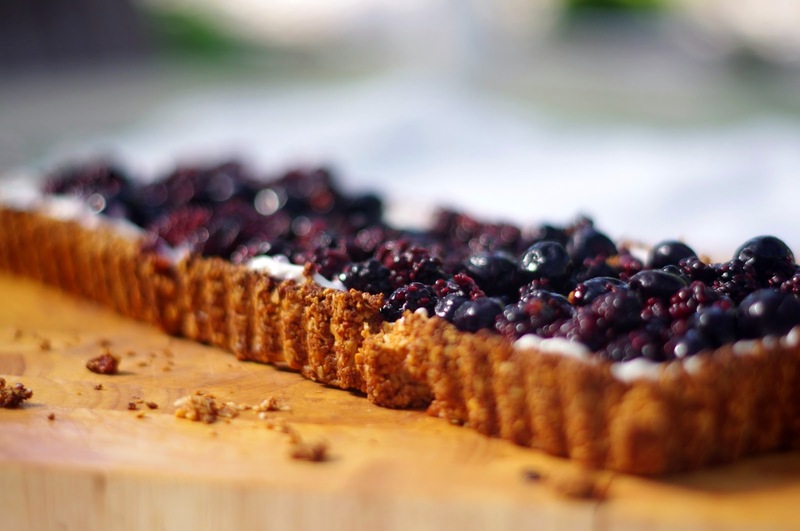 Spread yogurt evenly over the bottom of the tart and top with berries. Return to fridge to set. Have you been picking any fresh berries? Linking up with Essentially Jess for I Blog On Tuesdays and Fabulous Foodie Fridays. 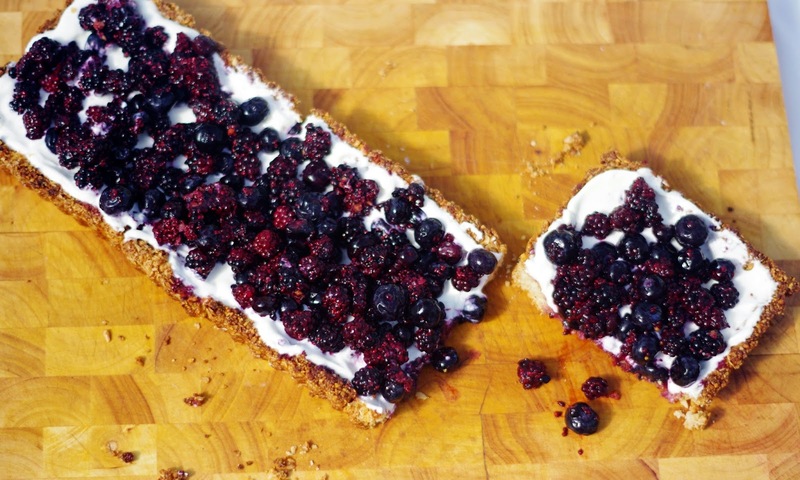 I LOVE blackberries, in fact all berries. I hope you've had a great start to 2015! Ooo that does look good. I don't think I've ever had fresh blackberries! That looks incredible! Berries are my favourite part of summer, I'm so sad we're starting to get towards the end of their season. I'll have to make this while I still can! 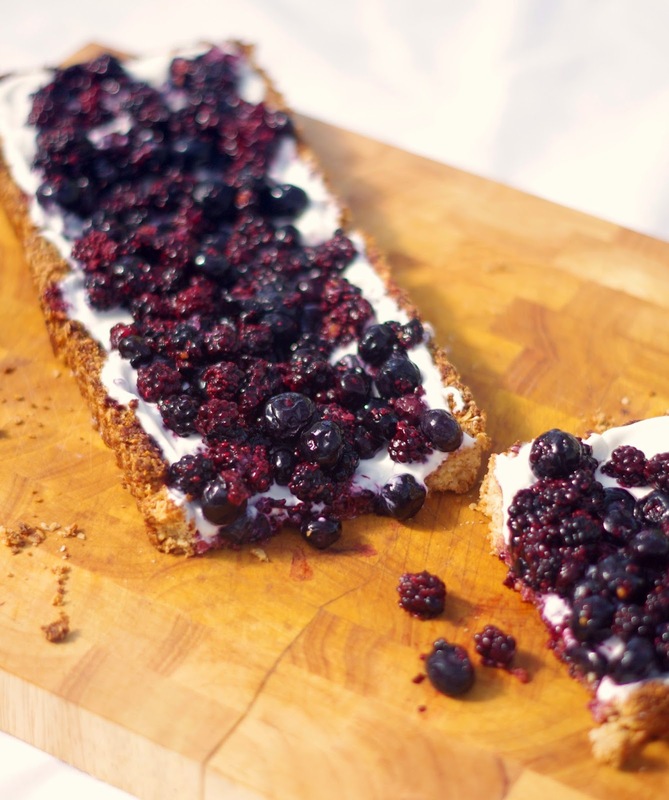 What a smart idea using yogurt! Yummy and guilt free!